I've been lucky enough to see plenty of moose since I moved to Alaska a few weeks ago. I came within 100 feet of one of them when I was riding my bike. I was on the way home when I saw this cute (but huge) moose in the middle of the road, and as I approached he just stood his ground, with the hair standing up on his back -- wait, standing its ground, hair standing on it's back?! Those are bad signs, right??? I quickly went into emergency mode: "Back up Al, just turn around and back up, don't try to go around him." (Now I'm a little farther away.) "Wow -- did you see how fast he moved across the road with just a few strides?! I'll just sit back here for a while and wait him out." I did wait him out, and after a little while he went on his way, letting me pass. But had he come after me, what should I have done? One item that isn't mentioned on those pages too much is that moose aren't meat-eaters, so, unlike bears, it's okay to run from them. If they attack it's not because they want to eat you for dinner, you've just done something to make them upset. 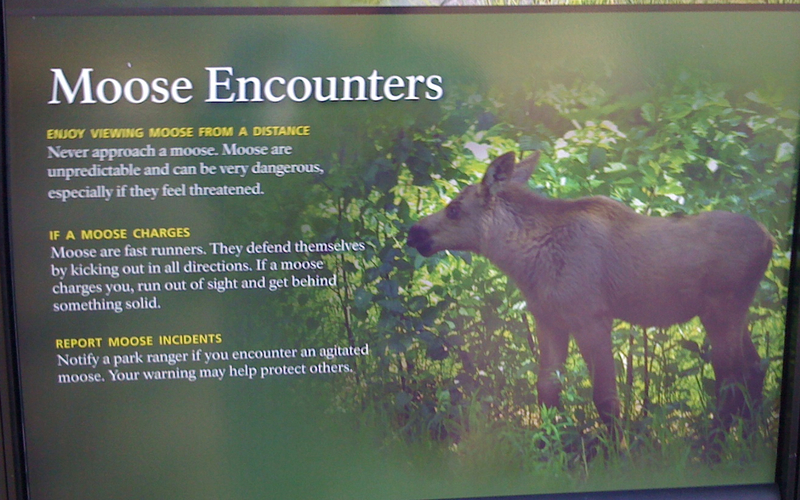 That provides a nice summary of the moose safety rules you'll find at those other web pages.